A newly-discovered asteroid near Neptune holds several clues about the early formation of our solar system. There are locations in our solar system where the gravitational forces of a planet and the Sun cancel out, allowing objects to exist there stably. These regions are known as Lagrangian points. Every Sun-planet combination has five such points (as do other pairs of bodies, like the Earth and the Moon), as you can see in the image up top. Astronomers have detected asteroids in some of the Lagrangian points around Jupiter and Neptune - these have been dubbed Trojan asteroids. These asteroids share the orbits of their planets, and they also help preserve vital clues about how our solar system formed. 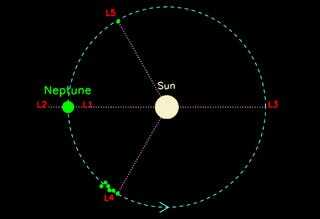 "The L4 and L5 Neptune Trojan stability regions lie about 60 degrees ahead of and behind the planet, respectively. Unlike the other three Lagrangian points, these two areas are particularly stable, so dust and other objects tend to collect there. We found 3 of the 6 known Neptune Trojans in the L4 region in the last several years, but L5 is very difficult to observe because the line-of-sight of the region is near the bright center of our galaxy." "We estimate that the new Neptune Trojan has a diameter of about 100 kilometers and that there are about 150 Neptune Trojans of similar size at L5. It matches the population estimates for the L4 Neptune stability region. This makes the Neptune Trojans more numerous than those bodies in the main asteroid belt between Mars and Jupiter. There are fewer Neptune Trojans known simply because they are very faint since they are so far from the Earth and Sun." Asteroid 2008 LC18 has an orbit that's extremely tilted relatively to the plane of the solar system, which is similar to several asteroids in the Lagrangian L4 point. That most likely means these asteroids were captured in the Lagrangian points during a very early period of solar system formation, before planets were brought onto a single orbital plane and Neptune itself revolved around the Sun in an orbit similar to that of the asteroids today. As the planets eventually locked into their current orbits, the asteroids were "frozen" in place at the points, but their eccentric orbits remained as evidence of a more chaotic time in the history of the solar system.